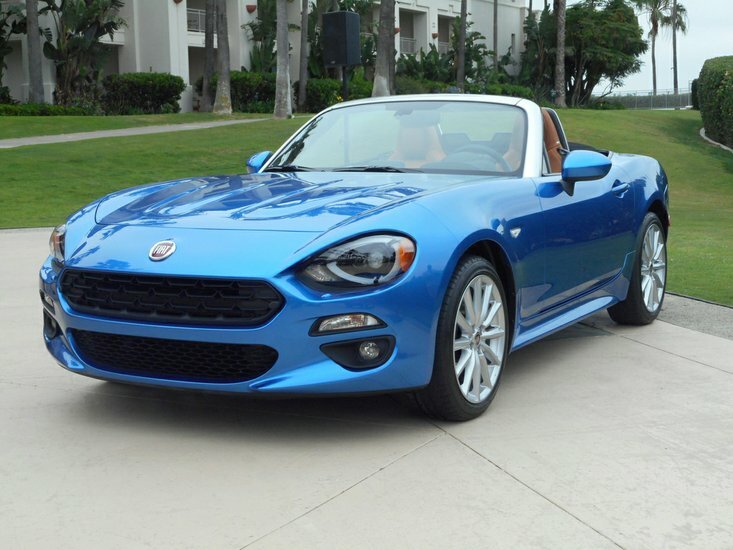 The 2017 Fiat 124 Spider was a two seat convertible or in the proper automotive lexicon it was a roadster. It was small, rear-wheel-drive, lightweight, and it had a turbocharged four cylinder engine. That 1.4-liter engine made 160 horsepower or 164 horsepower, depending on the trim line, and it made 184 pound-feet of torque. The Spider 124 could be equipped with either a six-speed automatic transmission or a six-speed manual gearbox. The manual transmission gets 25 mpg in the city and 35 mpg on the highway, while the automatic gets 25 mpg in the city and 36 mpg on the highway. No doubt a great deal of its fuel efficiency comes from the Fiat 124's light weight. It tips the scales from 2,436 lbs. to 2,516 lbs. depending on trim and transmission. When it goes on sale this summer, there will be three trim lines: the Classica started at $24,995, base price for the Lusso was $27,495 and the Abarth, the racing version, goes on sale in the third quarter starts and at $28,195. None of the prices include the $995 freight charge. There is also a Fiat 124 Prima Edizione. It is a special edition and only 124 will be made. It will have an exclusive Azzuro Italia (blue) exterior paint and premium Saddle colored leather seats. For $35,000, purchasers will receive branded merchandise and each car will be individual numbered. That's the relevant numbers but let's look at the intangibles. Fiat returned to the U.S. market five years ago. And even though it has sold 250,000 units, automotive wags think that is not enough to consider the Italian automaker's re-entry here a roaring success. The 124 was Fiat's most successful model in the U.S. First introduced in 1968 and on sale until 1983, it sold 183,000 copies. Although sales of any roadster are incremental, Fiat expects the 124 to increase its brand awareness in the market and to bring more millennials and Gen Xers into its 200 or so showrooms. They already comprise 40 percent of the automaker's customer base. Every product launch is important to any automaker, but Fiat has no room for failure with the 124. It is based on the Mazda MX-5 or Miata. That is a good start, the Miata is highly regarded. What did Fiat change? Just about everything, only the underbody or chassis remained. "We put a (new) top hat on that platform," said Leia Horton, the Fiat 124's program manager. In addition to a different engine, the 124 is five-inches longer than the MX-5, it had a honeycombed grille and Fiat designers wanted the headlights to be eyelids. Along with the grille, designers wanted the roadster's grille to look like an alert friendly face. Flowing graceful lines accentuate the extra length and made the car appear longer. There were power domes on the hood and sharp horizontal rear lamps which made the car look wider from the rear. The back fenders were shaped so that the upper surface fell inward toward the decklid. And there was an integrated spoiler. This was a good looking car. Read more on This Times Weekly.